This project is maintained by Canadian Dew Technologies Inc. (owned by Roland V. Wahlgren) whose main website is www.candew.ca. Were you reading the article, "Using the Drinking-Water-from-Air Resource in India"? Related information is found in CanDew-2500™ computer simulations for selected locations - India. 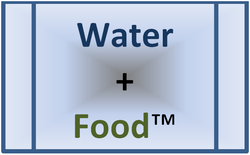 The WaterProducer-Greenhouse™ is a Canadian water-from-air technology for improving water and food security for people on tropical small islands. • Its relatively cool interior is suited for growing temperate zone crops at sea-level in tropical regions. • The greenhouse is designed to produce its own fresh water, by dehumidifying the ambient outdoor air, for crop irrigation and extra fresh water for a variety of uses by the local population. WaterProducer-Greenhouse™ concept. Graphic by Lorne Baird. © 2004 Batavia Greenhouse Builders Ltd. Click on image for enlarged view. CIDA Project — How the study came about... When could the first "water-producing" greenhouse be built? Benefits — Why did we do the study? Why is our greenhouse design special? Participants — Who was involved? Contact Us — We welcome your interest in our project! Location Map -- Where is Grand Turk? Buy Project Reports — Buy electronic copies of the eight reports we delivered to CIDA. Free download of Executive Summary! Our experiences with the Grand Turk Viability Study can be applied at many other tropical small island locations. Please contact us.